Sheriff, 1951. Ink, watercolor, and foil on paper, 14 x 11 in. Private collection. Cowboys, 1951. Ink on paper, 14 x 22 in. 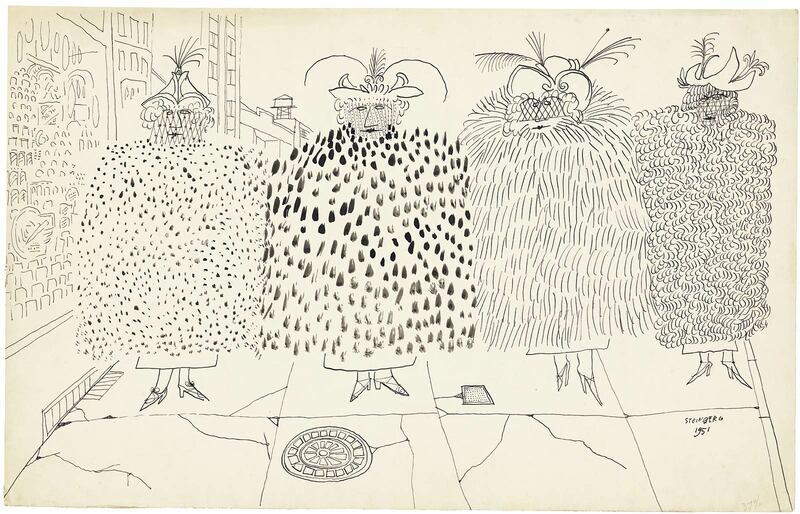 The Art Institute of Chicago; Gift of The Saul Steinberg Foundation. Galleria di Milano, 1951. Ink and watercolor on paper, 23 x 14 ½ in. Private collection. Untitled, 1951-52. Ink and pencil on paper, 114 ½ x 19 3/8 in. The Art Institute of Chicago; Gift of The Saul Steinberg Foundation. Untitled, 1954. Ink on paper, 14 ½ x 23 in. 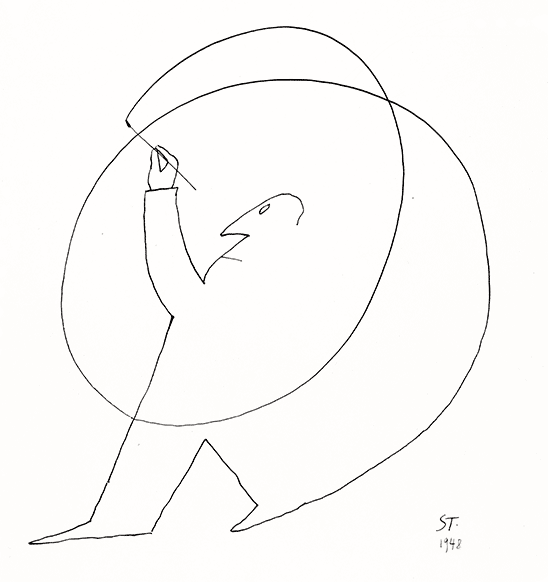 The Saul Steinberg Foundation. Untitled, 1949-54. Ink and pencil on paper, 14 ½ x 23 ¼ in. The Saul Steinberg Foundation. Highway Traffic, 1953. Ink, watercolor, and pencil on paper, 14 ½ x 23 in. The Saul Steinberg Foundation. Engine, 1951. Ink and crayon on paper, 14 ½ x 23 in. The Saul Steinberg Foundation. Untitled (Victoria-Brighton), 1953. Ink and crayon on paper, 15 ¾ x 12 3⁄8 in. Private collection. Untitled, 1950. Ink, colored pencil, pencil, and collage on paper, 14 ½ x 23 ½ in. The Morgan Library & Museum, New York; Gift of The Saul Steinberg Foundation. Document for Henri Cartier-Bresson, 1947. Ink and collage on paper, 14 3/8 x 11 3/16 in. Fondation Henri Cartier-Bresson, Paris. Fake Letters, c. 1950. Ink on 3 sheets of hotel letterhead; ink and wash on pseudo-photograph, 15 x 16 ½ in. The Saul Steinberg Foundation. The Declaration of Independence, 1949-54 (inscribed to Carl Theodor Dreyer and dated to the time of the gift, 1959). Ink on paper, 14 ½ x 22 ¾ in. Private collection. Fingerprint Landscape, 1950. Ink and fingerprints on paper, 14 ½ x 11 1/8 in. 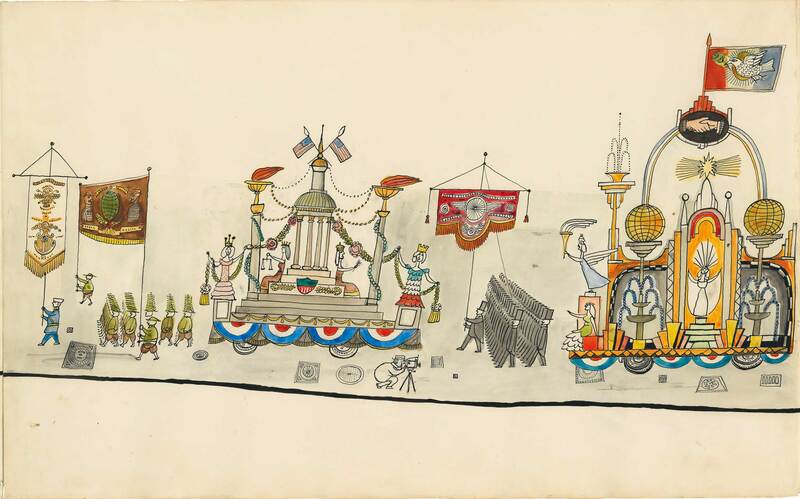 Saul Steinberg Papers, Beinecke Rare Book and Manuscript Library, Yale University. Untitled, c. 1950-52. Ink and pencil on sheet music paper, 19 1/8 x 14 1/8 in. The Saul Steinberg Foundation. Untitled (Flyscreen), c. 1950. Ink on graph paper, 11 x 8 ½ in. 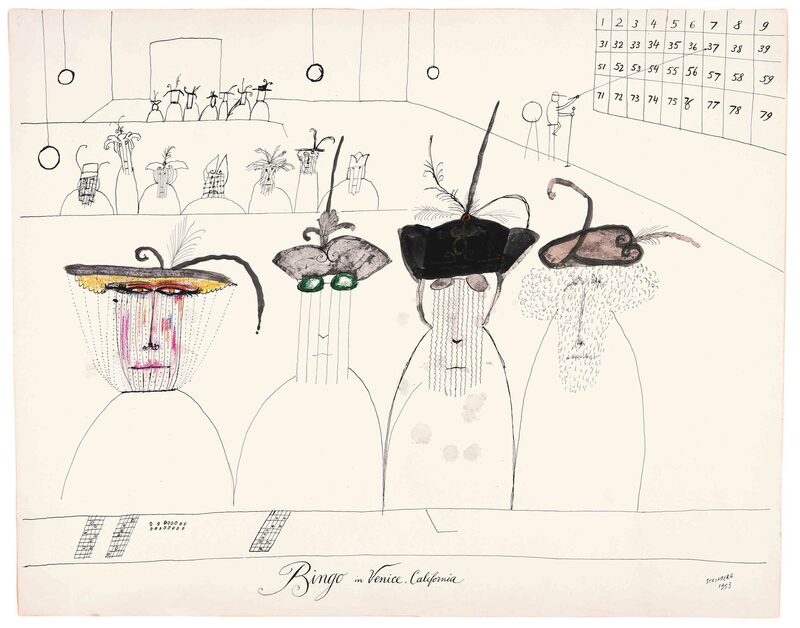 Saul Steinberg Papers, Beinecke Rare Book and Manuscript Library, Yale University. Untitled, 1950. Ink and graph paper, 12 x 9 in. Published in Steinberg, The Passport, 1954. Page of lampoons of chair designs from The Art of Living, 1949. Panel 1 of Parade, 1951. Ink, crayon, and gold paper on paper, 14 9/16 x 23 1/16 in. The Metropolitan Museum of Art, New York; Purchase, Elihu Root, Jr. Gift and Rogers Fund. Panel 2 of Parade, 1951. Ink, crayon, and gold paper on paper, 14 9/16 x 23 1/16 in. The Metropolitan Museum of Art, New York; Purchase, Elihu Root, Jr. Gift and Rogers Fund. Panel 3 of Parade, 1951. Ink, crayon, and gold paper on paper, 14 9/16 x 23 1/16 in. The Metropolitan Museum of Art, New York; Purchase, Elihu Root, Jr. Gift and Rogers Fund.